Based on our initial observations we have previously proposed that amyloidogenic protein may be an integral part of spirochetes (Miklossy, 1993, 1994a, Miklossy et al., 1996, 1998, 2006, 2008) and play a role in amyloidogenesis in Alzheimer disease. Therefore, the goal of our next study was to further analyze the amyloidogenic properties of spirochetes. Miklossy J, Kis A, Radenovic A, Miller L, Forro L, Martins R, Reiss K, Darbinian N, Darekar P, Mihaly L, Khalili K. Beta-amyloid deposition and Alzheimer's type changes induced by Borrelia spirochetes. Neurobiol Aging. 2006 Feb;27(2):228-36. The pathological hallmarks of Alzheimer's disease (AD) consist of beta-amyloid plaques and neurofibrillary tangles in affected brain areas. The processes, which drive this host reaction are unknown. To determine whether an analogous host reaction to that occurring in AD could be induced by infectious agents, we exposed mammalian glial and neuronal cells in vitro to Borrelia burgdorferi spirochetes and to the inflammatory bacterial lipopolysaccharide (LPS). Morphological changes analogous to the amyloid deposits of AD brain were observed following 2-8 weeks of exposure to the spirochetes. 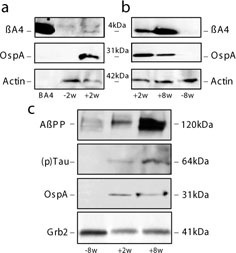 Increased levels of beta-amyloid precursor protein (AbetaPP) and hyperphosphorylated tau were also detected by Western blots of extracts of cultured cells that had been treated with spirochetes or LPS. These observations indicate that, by exposure to bacteria or to their toxic products, host responses similar in nature to those observed in AD may be induced. To determine whether an analogous host reaction to that occurring in Alzheimer disease could be induced by spirochetes, we exposed mammalian glial and neuronal cells in vitro to Borrelia burgdorferi. The results indicated that Borrelia spirochetes are able to induce the defining pathological hallmarks of Alzheimer disease, including Aβ deposition, increased AbPP levels, and hyperphosphorylation of tau. Thioflavin S positive and Aβ-immunoreactive “plaques”, as well as tangle- and granulovacuolar-like formations, were observed in cell and organotypic cultures exposed to Borellia burgdorferi. Morphological changes similar to those of the Alzheimer brain, including Aβ deposits, were observed following 2-8 weeks of Borrelia exposure. Western blot detected a 4 kDa Aβ immunoreactive band in the infected cultures. Increased levels of AβPP and hyperphosphorylated tau were also detected by Western blots of extracts of cultured cells that had been infected with spirochetes. These observations indicate that, by exposure to bacteria or to their toxic products, host responses similar in nature to those observed in Alzheimer disease may be induced. Bacteria or their degradation products may enhance a cascade of events leading to amyloid deposition in Alzheimer disease (Miklossy et al., 2006). Using Synchrotron InfraRed MicroSpectroscopy (SIMRS), we have analyzed whether the chemical spectrum of β-sheet conformation, which is typical of amyloid, may be detected in the Borrelia induced Thioflavin S-positive amyloid deposits. Synchrotron InfraRed MicroSpectroscopy (SIMRS) analysis detected a second peak near 1630 cm-1 in senile plaques in Alzheimer's disease, which is representative of β-sheet protein structure (Choo et al., 1996). Most importantly, this second peak near 1630 cm-1 was also observed in the Thioflavin S positive “plaques” in the cell cultures analyzed following 4-week exposure to spirochetes (Fig. 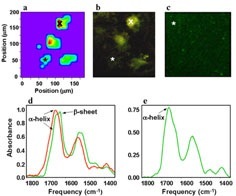 31).The infrared absorption microspectrum of the uninfected control samples exhibited a protein (Amide I) absorbance maximum near 1655 cm-1, representative of an average a-helical protein structure.